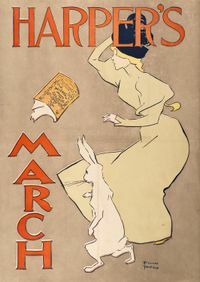 Edward Penfield, Harper’s March, 1895, color lithograph. Gift of Jack R. Bershad, 95.109. Art posters, many advertising periodicals to a burgeoning middle-class readership, thrived around the turn of the twentieth century. American Art Posters of the 1890s unearths more than a dozen of these works from the museum’s permanent collection. The bold designs of Edward Penfield, a leading illustrator of the era and the art director at Harper’s, will be a main feature of the exhibition.